At one end of this magnificent beach is a protected area that is ideal for small children to wade. Older children will enjoy body surfing and boogie boarding. Beachfront shacks serve up drinks & snacks. Have lunch at the Tiki Bar or across the road at Chefette (local fast food chain) or the restaurants at Quayside. Hop on the boardwalk at the northern end of the beach for a lovely stroll. There is a lifeguard on duty. Washrooms on-site. Enterprise (also known as Miami Beach) is another diverse beach with conditions for the entire family. One end is completely tranquil, perfect for younger kids. The waves on the other side of the beach are much livelier so older kids can body surf and boogie board. There is a lifeguard on duty and washroom facilities. Get drinks and lunch at the Mr.Delicious food truck or enjoy a picnic on the shaded benches. Head to this spot if you have older children who wish to try out kayaking or surfing. Smaller kids will love splashing around in the protected ocean pools and building sandcastles. Have a tasty local lunch or sandwiches and salads at the Surfers Point Cafe. You’ll quickly see why Worthing is one of the most popular beaches on the island! Soft white sands lead down to turquoise waters that are perfect for swimming & relaxing. Bring a snorkel & mask to explore the reef (which you can almost walk out to at low tide). Kayaks are available on the beach. There are several restaurants to choose from. Washroom facilities are available. For a quiet day at the beach with your kids, Reeds Bay is our top pick. This crescent bay located on the west coast of the island features calm waters that are perfect for the entire family. Bring snacks or a picnic lunch to enjoy under the shady trees along the beach. 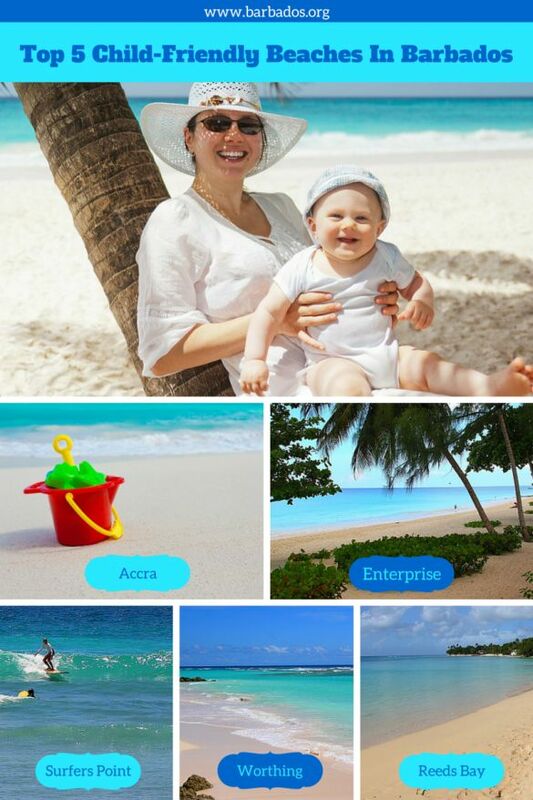 Our Barbados Beach Guide helps you find the perfect beach!